From 3/27 - 3/30, spend unbound gold and get bonus gift packs containing valuable items, including Superior Purses, Roses, and more. Now’s a great time to improve your intimacy with your friends and spouse! From 3/27 - 3/30, finish in the top 30 of the X-server Charm rankings at the end of each day and be rewarded! Rewards will be sent out daily. Feeling lucky? From 3/31 - 4/2, every 200 Gold you spend in the Shop gets you a spin of the Lucky Wheel. 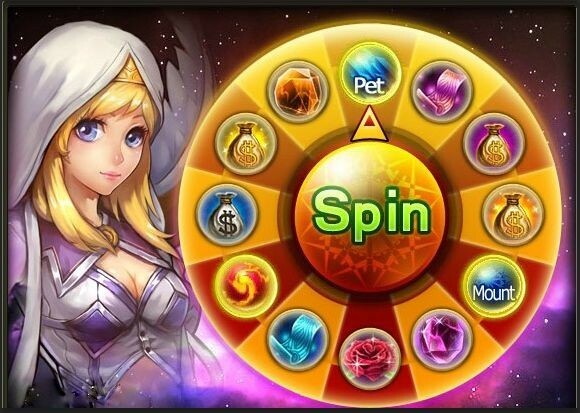 Each spin is a chance to win valuable prizes, including Mount Potential Pills, Pet Potential Pills, Sprite Potential Pills, and more! Defeat the demons and protect the peace of the Enchanted Land! The invasion happens on March 29th from 6:30 PM - 7:00 PM (Server Time). Every day from 3:15 PM - 3:30 PM, a powerful Treasure Guardian will spawn in the Confounding Forest. Level 40+ players can challenge them to win huge amounts of EXP and bound silver. From 3/27 - 4/2, upgrade your spirit or the growth and aptitude of your pets or mounts for a chance to get special items that will make upgrades even easier. 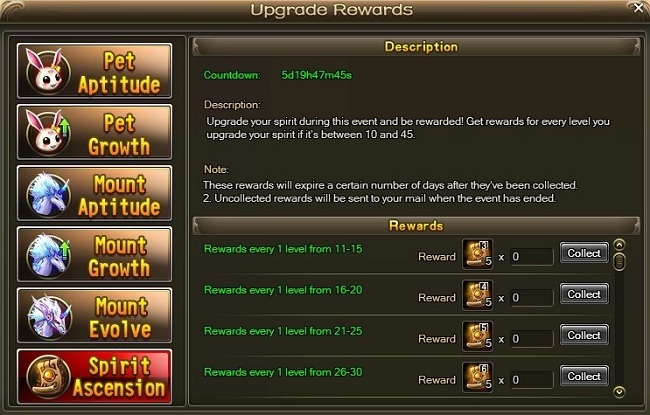 Click the “Upgrade Rewards” event icon for more details. - Stat bonuses will be obtained when all spirits have been upgraded to levels 10, 15, 20, 25, 30, 35, 40, 45 and 50. Want to see more treasure guards when using treasure maps, legendary stars in Star Shrine, and legendary fish in the Fishing event? If you answered yes to any of these, you’re in for a treat: from 3/27 – 4/2, all three will be happening! - The 20% discount on enchanting equipment and awakening battle souls has ended. - All of Eternal Saga’s European servers have been adjusted to Summer Time, which means all events will start an hour early beginning on 3/27. They’ll be back on schedule when the actual European Summer Time begins. - Fixed a bug where L50 of Elphame could not be completed. 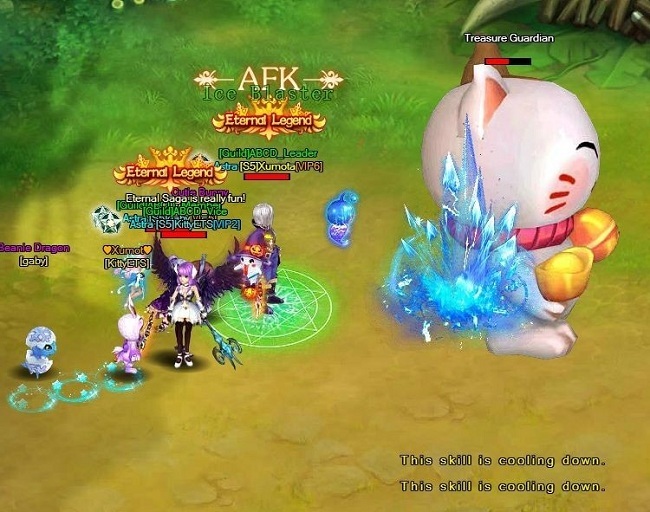 - Changed the name of “Mount Relic Star Stones” to simply “Star Stones”. - Various other language and UI fixes. Description: Spend unbound gold and get bonus gift packs containing valuable items, including Superior Purses, Roses, Mount Evolve Luck Pills and more. Now’s a great time to improve your intimacy with your friends and spouse! Description: Feeling lucky? During this event, every 200 Gold you spend in the Shop gets you a spin of the Lucky Wheel. Each spin is a chance to win valuable prizes, including Mount Potential Pills, Pet Potential Pills, Sprite Potential Pills, and more! Description: Prepare to be invaded! On March 29th from 18:30-19:00 (server time), waves of monsters will be storming the Enchanted Land. Level 40+ players who are up to the challenge must fend off a wave of these savage beasts once every six minutes, through a total of five waves. Rewards include Soul Shards, Demon Shards, Dragon Shards, EXP, and Sprite related items. Description: From 3/27 - 4/2, upgrade your spirit or the growth and aptitude of your pets or mounts for a chance to get special items that will make upgrades even easier. Click the icon for more details. Description: Want to see more treasure guards when using treasure maps, legendary stars in Star Shrine, and legendary fish in the Fishing event? If you answered yes to any of these, you’re in for a treat: for the following week, all three will be happening! Description: Every day from 3:15 PM - 3:30 PM, a powerful Treasure Guardian will spawn in the Confounding Forest. Level 40+ players can challenge it to win huge amounts of EXP and bound silver.